on the United States Airforce website. This is a remarkable tool for research. One of these Early Birds is the oldest-living former Commander of this Base. General Martin F. Scanlon as a Major, directed operations at the field as its second leader, from November 1919 to June 1922. He was Commander again from January 1935 for one year. 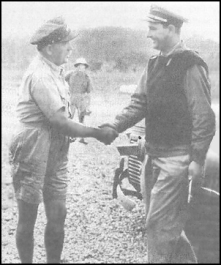 The ninth Commander was another Early Bird, General Howard C. Davidson who served from January 1928 to August 1932. In all, there were twelve former Commanders at the ceremony.